It’s a sales professional’s worst nightmare. You lost the sale. That means you also lost the chance to turn a prospect into a raving fan and a customer for life, not to mention lost profits, future business, and a little bit of your reputation … all because your sales team dropped the ball with a potential customer or client. The key to avoiding lost sales is better sales pipeline management. Clear and focused pipeline management. At OnePageCRM, we’ve seen it many times before. It’s happened to us, and to the dedicated sales teams we’ve worked with in the past. And what we’ve come to realize is that it all comes down to a failure of CRM -- Customer Relationship Management software. You’ve probably heard that old sales & marketing maxim that it takes 7 points of contact to make a sale. These days, thanks to digital technology, the number is far greater -- some experts say 13 or more. But those contacts have to be strategically scheduled, planned, and executed. These days, successful sales teams know that they have to create a real relationship with the prospect. That means they have to give the right information to the right person at the right moment, and they have to manage every prospect in the sales pipeline carefully, at all times. That’s what the best CRM software solutions do. Yet so many dedicated, skilled sales professionals are struggling to perform without an effective CRM backing them up. It’s no secret that a great CRM solution helps you convert prospects into loyal customers who buy from you again and again, or that the best CRM actually helps you pick up extra sales that your company might otherwise lose. But with so many CRM solutions out there, how are you supposed to pick the best CRM for your sales team? 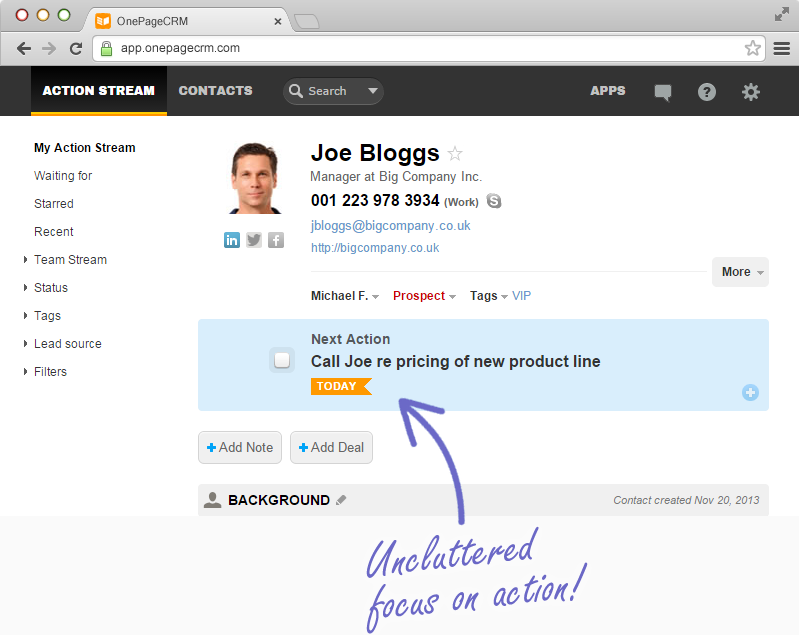 Easy to set up and use, right off the bat: OnePageCRM knows that the CRM you can’t configure and use is … well, useless. That’s why we made it easy to configure, easy to add a company or client, and easy to use. Adapts nicely to your sales workflow: The best CRM serves you and your sales team, instead of requiring your team to adapt to the CRM. 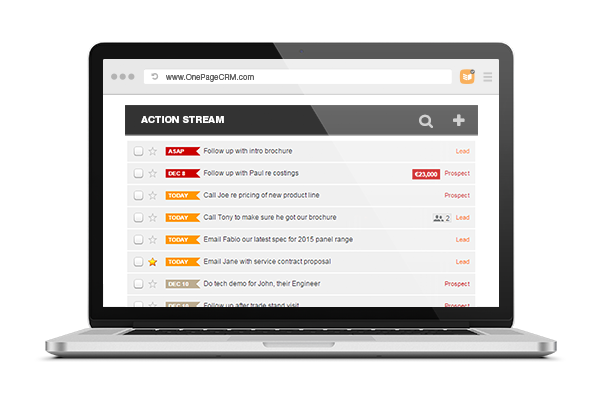 OnePageCRM helps your sales team focus on next actions, with a GTD-based design that makes more sense and helps you get more done. 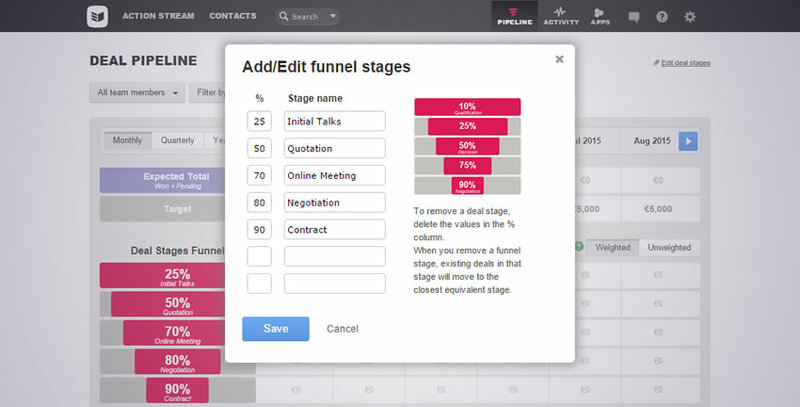 An intuitive, user-friendly UI: If your sales pros can’t figure out quickly how to add and process their prospects, your CRM isn’t doing its job. OnePageCRM makes it easy to capture and manage those hot prospects. Integrates easily with apps you already use: Unbounce, MailChimp, Evernote, Skype, and so much more -- OnePageCRM integrates beautifully with the apps your business already depends on. Fully functional on mobile devices: Smartphones and tablets are essential parts of your sales infrastructure, so why would you pick a CRM that doesn’t respect that? With apps for both iOS and Android, OnePageCRM gives your sales team full mobile functionality when they’re on the go. World-class support: With readable documentation, multiple training options, and one-on-one assistance when you need it, OnePageCRM offers premium support without the premium price tag. We’re confident that OnePageCRM is the answer to your sales pipeline management needs. That’s why we created a generous 21-day free trial period, so you can see for yourself how easy it is to use. Sign up for our free, no-obligation trial to see the best CRM platform in action and try it out for yourself.